The Tuareg (sometimes spelled Touareg in French, or Twareg in English) is a name for a group of peoples who share a Berber ethnic group loosely forming a type of indigenous nation-state. The Tuareg people inhabit a large area covering almost all the middle and western Sahara and the north-central Sahel. In Tuareg terms, the Sahara is not one desert but many, so they call it Tinariwen "the Deserts." The Tuareg have been disrupted by the post-colonial division of nations that placed them within the separate countries of Niger, Burkina Faso, Libya, Mali, and Algeria. The 1990s brought much warfare and strife for them with various resolutions in the different nations. As humankind advances into a globalized society the place of the Tuareg is yet to be defined. Their old ways of trading using camel-caravans no longer support them, and an alternative way of life that preserves their identity but allows them to advance together with the human family into a world of peace and prosperity has yet to be established. The origin of the name Tuareg does not originate within the Berber group, and its meaning has been long discussed. Probably it derives from Twārəg, the "broken plural" of Tārgi, a Ḥassānīya Arabic word whose former meaning was "inhabitant of Targa" (the Tuareg name of the Libyan region commonly known as Fezzan; targa in Berber means "(drainage) channel"). The name Tuareg was applied to them by early explorers and historians, but the people call themselves variously Kel Tamajaq (Speakers of Tamajaq), Imajaghan (Tuareg people), or the Imouhar (the free people). The Tuareg language is a southern Berber language having several dialects among the different regions. Berber is an Afro-Asiatic language closely related to Egyptian and Semitic-Canaanite languages. The language is called Tamasheq by western Tuareg in Mali, Tamahaq among Algerian and Libyan Tuareg, and Tamajaq in the Azawagh and Aïr regions, Niger. The Tamajaq writing system, tifinaɤ (also called Shifinagh), descends directly from the original Berber script used by the Numidians in pre-Roman times. The ancient Lybico-Berber alphabet is from the Punic script, which was used in the extinct Phoenician language and was used irregularly up until the time of Augustine by various languages. Today, it survived irregular usage with the Tuareg. The Tuareg are classified as a Berber group, and are closely related to both Northwest African Berbers and West Africans in terms of culture and race. They do not have Arabic ethnicity. Some argue that the Tuareg are defined by language and culture, not by race, and that predominantly Middle Eastern and/or Indigenous African Tamasheq speakers qualify as "Tuareg." By implication, individuals of Tuareg descent but who have assimilated into various countries and do not speak Tamasheq languages would not be considered Tuareg. This is part of the reason for the widely varying estimates of the number of contemporary Tuareg. Originally farmers descended from Berbers in the region that is now Libya, the Tuareg are descendants of ancient Saharan peoples. Herodotus described this ancient Libyan people, the Garamantes, a Saharan Berber people who founded a prosperous kingdom in the Fezzan area of modern-day Libya. Evidence of this Garamantian Empire is found in the ruins of Germa. With many invaders, colonists, and explorers, the Tuareg slowly migrated southward, into the Sahel, with the promise of greater prosperity through trade. The Tuareg adopted nomadism along with its distinctive form of social organization from camel-herding Arabs about two thousand years ago, when the camel was introduced to the Sahara from Saudi Arabia. According to legend, Tin Hinan, heroine and spiritual leader, founded a kingdom in the Ahaggar mountains in the early part of the fifth century C.E. She was both heroine and matriarch and is believed to have come from the Tafilalt oasis in the Atlas Mountains in the area of the modern Morocco. Even today the Tuaregs call her "Mother of Us All." From that time until French colonization the Tuareg were organized into loose confederations, each consisting of a dozen or so tribes. Each of the main groups had a traditional leader called Amenokal along with an assembly of tribal chiefs (imɤaran, singular amɤar). The groups were the Kel Ahaggar, Kel Ajjer, Kel Ayr, Adrar n Fughas, Iwəlləmədan and Kel Gres. For over two millennia, the Tuareg operated the trans-Saharan caravan trade connecting the great cities on the southern edge of the Sahara to the northern Mediterranean coast of Africa. For over two millennia, the Tuareg operated the trans-Saharan caravan trade connecting the great cities on the southern edge of the Sahara to the northern Mediterranean coast of Africa. This continued into the twentieth century when the European trains and trucks took over most of the trade routes. Their five basic trade routes extended from the southern edges of the Saharan deserts to the northern Mediterranean coast of Africa, where Tuareg merchants delivered their goods to be distributed throughout the world. Transportation was very difficult and there was limited space in the caravans, so the Tuareg usually traded in luxury items which would bring a large profit while taking up little space. Tuareg were also responsible for bringing enslaved people north from west Africa to be sold to Europeans and Middle Easterners. Occasionally the Tuareg themselves took captives, with any who were not sold being assimilated into the Tuareg community. Captive servants and herdsmen formed a component of the division of labor in camel nomadism. In the early nineteenth century, the Tuareg resisted the French invasion of their Central Saharan homelands for the purpose of colonization. Tuareg broadswords were no match for the more advanced weapons of French squadrons.In southern Algeria, the French met some of the strongest resistance from the Ahaggar Tuareg. Their Amenokal, traditional chief Moussa ag Amastan, fought numerous battles in defense of the region. Finally, the Tuareg were subdued and required to sign treaties in Mali in 1905 and Niger in 1917. Tuareg territories were taken under French governance and their confederations were largely dismantled and reorganized. 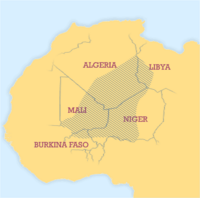 Following the independence of African countries in the 1960s, Tuareg territory was artificially divided into modern nations with large populations in Niger, Mali, Algeria, Libya, and Burkina Faso. Political disruption and economic constraints followed French colonization, and generally tight restrictions were placed on nomadism. Long-standing competition for resources in the Sahel and with issues of wells, desertification and the increased firewood needs of growing cities impacted Tuareg conflicts with neighboring African groups. Native ideas of authority conflicted with the newly established national authorities and many various unresolved problems remain. In Mali, a Tuareg uprising resurfaced in the Adrar N'Fughas mountains in the 1960s, following Mali's independence. In May 1990, in the aftermath of a clash between government soldiers and Tuareg outside a prison in Tchin-Tabaraden, Niger, Tuaregs in both Mali and Niger claimed autonomy for their traditional homeland: (Tenere in Niger and the Azawad region of Mali). Deadly clashes between Tuareg freedom-fighters and the military of both countries followed, with deaths numbering well into the thousands. Mali tried to involve international agencies such as Amnesty International and the government tried to highlight atrocities by the Tuareg. Although an agreement was signed in 1991, some young Tuareg were disillusioned by the hastiness and they felt the agreement was signed in an insincere way. Several dozen young Tuareg men were killed in Timbuktu, Mali by the government forces who probably preferred a military solution. Although a further conference was called in Niger, the extra-judicial deaths were not addressed and many Tuareg were further alienated. In Niger, in 1992, more misunderstanding and more killings ensued. Various allegations of atrocity were backed up by the "Working group for Indigenous Peoples" a body of the United Nations. The Tuareg were incensed that previous killings were not addressed, and many para-military groups of young Tuareg were formed under various leadership and philosophies. A national region for the Tuareg was proposed and defeated by the national conference, and more violence ensued. There was a general purge of Tuareg in northern Mali and hundreds of thousands fled the area. At the end of 1992, Niger adopted a new constitution. In 1993, some Tuareg paramilitary groups took to discrediting the government as not being capable of protecting the Tuareg. They began committing various criminal activities and showed that they could not be stopped. This led to a general public outcry against the Tuareg with various reprisals in other nations. Further negotiations in 1994 in Niger initiated by France and Algeria were darkened by a tragedy where medical aid was refused to the Tuareg in light of violence inflicted at a celebration by unknown assailants. Yet these negotiations led to peace agreements in 1995. The agreement in Niger and the constitutional change in Mali in 1992 both called for decentralization of national power and guaranteed the integration of Tuareg resistance fighters into the countries' respective national armies. Major fighting between the Tuareg resistance and government security forces ended after the 1995 and 1996 agreements, but sporadic fighting continued in Niger in 2004 between government forces and groups struggling to obtain Tuareg independence. Traditionally, Tuareg society is a class society, with nobility and vassals. It was divided between those who tended the land and those who did not, with farming being the lower class activity. The pastoral work was specialized according to social class: imúšaɤ, warrior-aristocrats who organized group defense, livestock raids, and the long-distance caravan trade; ímɤad, vassal-herdsmen who pastured and tended most of the confederation's livestock; ìnhædˤæn, blacksmith-clients who fabricated and repaired the saddles, tools, household equipment, and other material needs of the community. After the adoption of Islam, a separate class of religious clerics, the marabout, also became integral to Tuareg social structure. The Tuareg also held èklan "slaves," who were often war prisoners darker than the generally brown-skinned Tuareg, who are also known as the Bella. Some of these slaves also came from those not sold in trading. Under the older system, the farming groups would pay allegiance to locally-appointed headmen, who in turn reported to nobles who considered the village their domain. As the trans-Saharan trade routes diminished in importance, and the farmers accumulated wealth, the social structure changed. During the colonial and post-colonial national eras, the awarding of governmental posts also altered the social strata and the social structures of modern Tuareg are varied. The Tuareg are matrilineal, though not matriarchal. Unlike many Muslim societies, the women do not traditionally wear the veil, whereas the men do. The most famous Tuareg symbol is the Tagelmust, their veil, which is often blue indigo colored. The men's facial covering originates from the belief that such action wards off evil spirits, but most probably relates to protection against the harsh desert sands as well; in any event, it is a firmly established tradition (as is the wearing of amulets containing verses from the Qur'an). Men begin wearing a veil when they reach maturity which usually conceals their entire face excluding their eyes and top of nose. The Tuareg are sometimes called the "Blue People" because the indigo pigment in the cloth of their traditional robes and turbans stained the wearer's skin dark blue. Today, the traditional indigo turban is still preferred for celebrations, although generally Tuareg wear clothing and turbans in a variety of colors. Traditionally Tuaregs were animists. 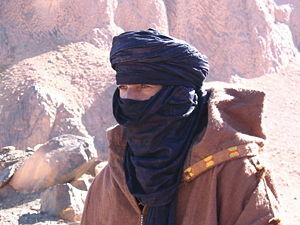 As the unique identity of the Tuareg developed through their migration southward they also became predominantly Muslim by the sixteenth century. With the severe demands of their nomadic travels, the requirements of Ramadan and other fasts were relaxed and generally the Tuareg are more inclined to observe feasts than fasts. Originally with a large Sufi component, today they combine Sunni Islam (specifically the Maliki madhhab, popular in North and West Africa) with certain pre-Islamic animistic beliefs, including spirits of nature (Kel Asuf) and djinns and such syncretic beliefs as divination through means of the Qur'an. Much Tuareg art is in the form of jewelery, leather, metal saddle decorations called Trik, and finely crafted swords. 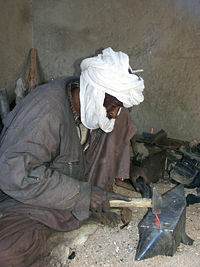 The Inadan community makes traditional handicrafts including such items as Tanaghilt or Zakkat (the 'Agadez Cross' or 'Croix d'Agadez'); the Tuareg Takoba, a nearly one-meter-long sword, with red leather cover; and beautiful gold and silver-made necklaces called Takaza and earrings called Tizabaten. Traditional Tuareg music has two major components: the single-string bowed instrument called Anzad which is played by the women to accompany songs, often during an evening ceremony, and a small tambourine covered with goatskin called Tende which is used during camel races and horse races and other festivities. Traditional songs called Asak and Tisiway (poems) are sung by women and men during feasts and social occasions. Another popular Tuareg musical genre is Takamba known for its Afro-Berber percussion. Many music groups emerged after the 1980s cultural revival, some combining indigenous music styles with electric guitars and contemporary instruments. Many Tuareg have settled into the communities with which they traded, serving as local merchants and representatives for their friends and family who continued to trade. Some Tuareg farm or herd animals on areas designated as homelands by their national governments, resembling the Native American Indian Reservations in the United States. Some "settlement" areas are more like refugee camps, especially in areas with vague regulations or unresolved contention with the Tuareg. Although in 2006 the HIV/AIDS rates among the Tuareg were lower than the national populations in the countries they inhabit, workers in this field have predicted the increase in the occurrence of the disease if their situations are not stabilized. Many Tuareg today are either settled agriculturalists or nomadic cattle breeders, although there are still blacksmiths and caravan leaders. Some have abandoned farming and herding, and sought jobs in towns and cities individually, melding into the urban culture. All links retrieved December 19, 2015. This page was last modified on 19 December 2015, at 18:27.